In a standoffish match, Sporting managed to grab a 1-0 victory that could prove absolutely decisive in one week's time. Sporting manager Ricardo Sá Pinto was clearly humble enough to learn from FC Porto's mistakes in the last round against the same opponent and chose a very different approach from Vítor Pereira. In fact, Sá Pinto went with a somewhat unusual (for Portuguese teams, that is) lopsided 4x4x2 (see image below), mirroring to perfection the expected City's lineup. Carriço and Schaars were in charge of patrolling the area in front of their back four and, even though Capel and Izmailov both completed a line of four, the Russian was much narrower, most likely predicting David Silva's tendency to drift inward. Schaars was instructed to sit a bit further up from Carriço, so that they would be better spread out on the field. Manchester City were roughly their usual selves in away matches. With Clichy deputising for Micah Richards as right-back, Milner as a sort of right-winger and Silva on the left, City were compelled to go down the central route, crashing against the well-drilled Sporting defence. Instead of playing the match as if both teams were equal, the Lions started carefully, wary of leaving their defensive line exposed (like FC Porto did on both games). Faced with an English team with Italian DNA, Sá Pinto was happy to play the underdog and give the control of the match to City, hoping that Sporting would outpace them in quick breakaways. With Izmailov helping out defensively in the middle of the park, almost every intercepted ball quickly found João Pereira's path, particularly because - it's a well-known fact - David Silva is not keen on tracking back as soon as possible. City were slow and seemed to think that things would naturally fall into place, shifting the ball from side to side, waiting for Silva to do his usual thing. Van Wolfswinkel and Matías Fernández, in turn, worked very hard trying to keep City's centre-midfielders busy by reducing their passing options. After 25 minutes, Sporting became less cautious and fearful and tried to take the game back to City, namely by shooting from long range. The first half came to its end and both teams seemed more afraid of conceding a goal than willing to score one. Xandão scored a wonderful back-heel quickly into the second half and it looked like the game had to open up. Even though Sporting were a bit too eager to take their cues from the crowd in the minutes that followed, they managed to maintain their emotional control and resisted the temptation to ride the wave, sticking to their game plan instead. 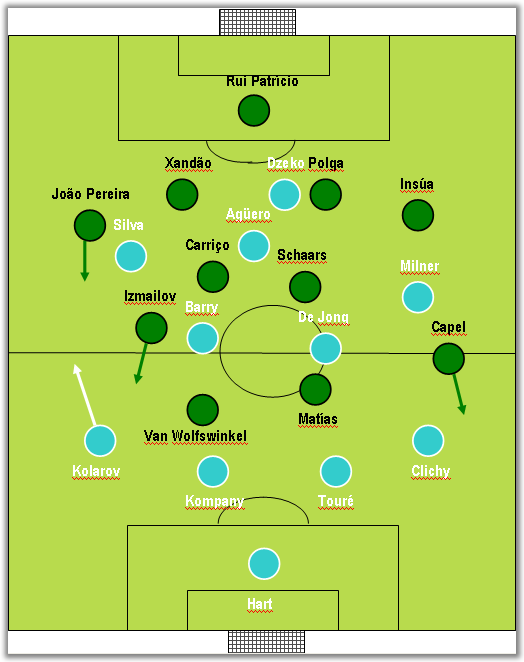 While Mancini replaced Dzeko (another uninspiring display from the Bosnian) with Balotelli, Sá Pinto tried to make sure that Sporting would not concede what might prove to a crucial away goal to City by bringing on Pereirinha and Renato Neto for Izmailov and Matías, respectively. The message was clear to everyone: the result was perfect and their one-goal advantage was to remain intact. Balotelli was in fact the only Citizen able to cause problems for Sporting (chiefly the short-tempered João Pereira) and City came very close to the equalizer in the final stages of the game, including a header from Balotelli that hit the crossbar. In conclusion, Sporting manager acknowledged the differences between the two teams and managed to convince his players that they had to work very hard and be willing to see less of the ball, if they were to succeed. His Italian approach worked to perfection and Mancini is once again reminded of his own shortcomings when it comes to European competitions, even if Sporting can count themselves fortunate. Individually, I would like to highlight Matías Fernández's work rate and presence, since he was the main link between defence and attack, providing the team's first out-ball, but I would also like to praise the ill-regarded Anderson Polga. While Xandão showed once again that he can be a valuable asset to the squad, the Brazilian world champion showed that he still is a very good player when the defensive line is not constantly caught off-guard.